Result of draw 09/01/2011 in Shine’s Bar: 3, 7, 15, 25. There was no winner of the jackpot of €9400. There were three ‘match 3’ winners receiving €70 each. Next week €9600 in The Mill Bar, Bealnamulla. 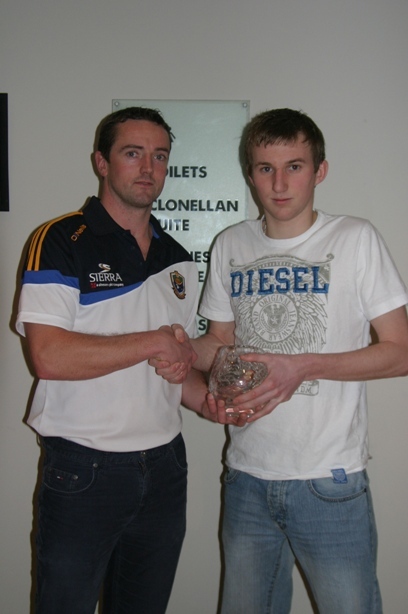 Congratulations to Philip Lennon who was awarded Clann na nGael Young Player of the year 2011. Clann na nGael and Roscommon Player, Jonathan Dunning presented Philip with the award in the Athlone Springs Hotel at the weekend. 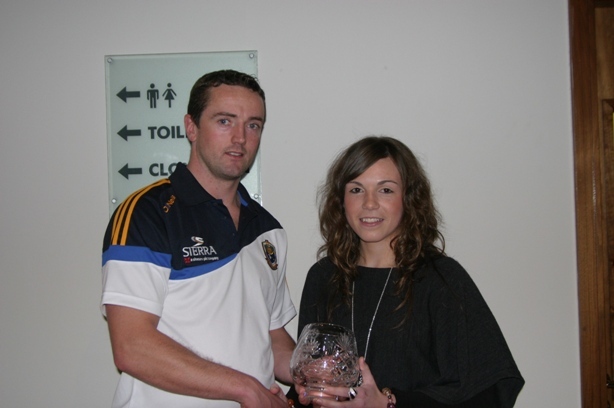 Congratulations to Tina O’Brien who was awarded Clann na nGael Ladies Young Player of the year 2011. Clann na nGael and Roscommon Player, Jonathan Dunning presented Tina with the award in the Athlone Springs Hotel at the weekend. A reminder to all club members that the Clann na nGael AGM will be held this Friday 14th January at 8pm in the Clubhouse, Johnstown.